Filling a basket with raspberries, blueberries, currants, gooseberries and blackberries is a joyful reminder of simpler times. You don’t need a large garden to enjoy these fruits, and once you’ve grown a few you’ll be hooked. Mulch the soil for a good crop: The raspberry is a woodland plant that appreciates a mulch of partially composted dead leaves, twigs, straw, tree bark, wood shavings, pine needles or any other woody debris. Added on a regular basis, these materials will decompose and create the acidity that the plant needs to grow. Mulching also provides protection against diseases such as spur blight � a common problem in cooler parts of the country � and helps to keep weed growth down. Raspberries need support: Raspberry stems, or canes, are extremely supple and are liable to be flattened by wind, rain and the weight of the fruit. It is essential to provide some kind of support; For example, a post-and-wire system. Sink two posts into the ground at either end of the row of canes, reinforcing each one with an angled strut. Stretch galvanised wire between the posts, at a height of about 1.7 metres. Tighten one end with a straining bolt. Tie each cane to the wire with a plastic tie, a piece of garden twine or a length of raffia. 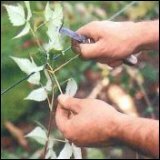 Pruning raspberries: Regular pruning ensures a succession of healthy new canes and good fruit production. When, and how you prune depends on the variety of raspberry. 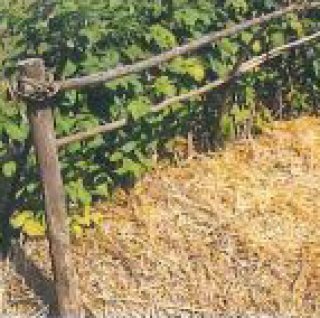 Summer-Fruiting varieties: Once fruiting is over, cut the canes that have just fruited down to ground level. Tie in canes that have grown during the current season. The following spring, cut back the tips on the new canes to a healthy bud. Autumn-Fruiting varieties: Prune in February, cutting all the canes down to ground level. Combating raspberry beetle: This pest is often spotted when you are picking the ripe fruit. Keep an eye out for the adult beetles, which lay their eggs on the flowers, and for the brown grubs, which burrow into the centre of the fruit. A traditional way to prevent the problem is to plant forget�me-nots (Myosotis) next to your raspberries. They self�seed readily and will act as a deterrent. Inspect your raspberries regularly during the summer. 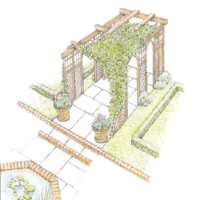 Make your way along the row, tapping the foliage and collecting any beetles in a bowl held beneath the leaves. Then all you have to do is take away the insects and destroy them. The raspberry is a perennial that sends up new shoots from its underground roots at different times of the year, depending on whether the variety is summer or autumn-Fruiting. Summer-Fruiting varieties: These fruit once a year, in summer. As some of the shoots bear Fruit, others are growing and developing. The new shoots will bear fruit the following year, while the current fruit�bearing shoots will die off. Autumn-Fruiting varieties: The fruit on these varieties appears from September until the first frosts, on canes that have developed in the current year. 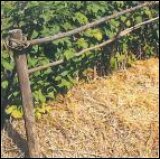 Plant raspberry canes in Autumn. Add well-rotted manure to the base of the planting hole and, if your soil is dry or chalky, mix in a quantity of ericaceous compost. Plant only about 10cm deep and spread the roots out. Planting too deep inhibits the development of beneficial suckers. Firm the soil around the base of the canes. Leave a hollow around the base of each plant, and water well. 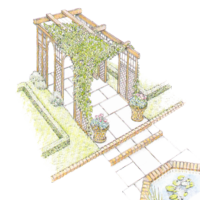 Once the plant has settled in, cut down the canes to 25cm above the ground, cutting at an angle above a bud. 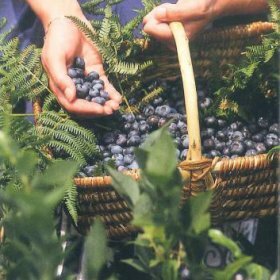 Blueberry history: The American blueberry (Vaccinum corymbosum) is a modern variety, and is much more productive than the small European species (Vaccinum myrtillus), although some say it has less flavour. The European blueberry, or bilberry, grows wild in many European countries, including Britain. It is extremely difficult to grow outside its natural habitat, so in a garden the American blueberry may be a better choice. The American blueberry reaches one to two metres high and produces one to three kilogrammes (and sometimes as much as ten kilogram’s) of fruit per bush. It is very decorative when its leaves turn red in autumn. Unlike the European blueberry, which grows happily in woodland, the American variety only fruits well in full sun, so choose its position carefully. Blueberries need acid soil: Like its wild counterpart, which grows on peaty heaths, the cultivated blueberry needs an acid soil. You’ll be able to identify your soil type by looking at the local flora. Bracken, gorse, broom and foxgloves are all acid-loving plants. If you don’t have the right soil, blueberries can be grown in a large container of ericaceous compost. When planting blueberry bushes, dig a hole 50cm across and fill it with a mixture of equal parts ericaceous compost, leaf or pine�needle mould and well-rotted garden compost. Leave 1.5 metres between plants. Give the plants an annual top-dressing of moss peat or acid leaf-mould to enrich the soil. Alternatively, feed them with an ericaceous plant food. Always pick blueberries by hand: Don’t be tempted to use any of the contraptions which are available for gathering wild fruit. Apart from the fact that they gather as many leaves as berries, they will damage berries of the large�Fruited cultivated varieties. There’s only one solution � lots of patience and picking by hand. Blueberry pairing: Cultivated blueberries require a pollinating partner to ensure a good crop of fruits. Therefore, you need to plant two different varieties, making sure they will flower at the same time to ensure cross�pollination. Choose between early varieties, such as ‘Bluetta’, ‘Duke’, ‘Patriot’ and ‘Bluecrop’, whose fruit ripens in July, and later varieties, such as ‘Nelson’ and ‘Brigitta’, which ripen in August and September. Glen Clova: An old Favourite with high yields of fruit; the Fruits are small, so ideal for freezing. 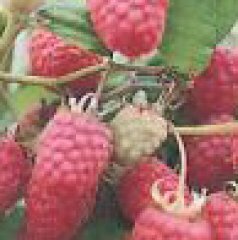 Glen May: A popular choice as it is spine free, has large berries and produces plenty of Fruit. Leo: Tangy but tasty orange-red Fruits; aphid resistant. Malling Admiral: A good all-rounder; doesn’t do well in wet soil but is resistant to spur blight. Autumn Bliss: A self-supporting variety with good Flavour; Fruits ripen from August onwards. Fallgold: A late variety with yellow Fruit. Heritage: A high-yield variety with average Flavour; second harvest from late August until the first frosts. September: An aromatic Fruit with a slightly sharp taste; second harvest in September�October. Zeva: A well-known, large-Fruited variety; second harvest in September�October.